Before viewing 2014's The Calling, I did some research on whether or not it had a theatrical release. It did but the screen count was so small that nothing in terms of box office receipts, even registered. Basically, what's being reviewed here is yet again another generically titled thriller (isn't The Calling a band?) with a real good cast and a novice, unknown director to go along with it. That smells like straight-to-DVD right out of the gate. Time to plug in the microwave and fire up the Pop Secret. It's movie night people! Shot entirely in Ontario, Canada, taking place in Ontario, Canada (the town of Fort Dundas to be exact) and having virtually no actors/actresses with any smidgen of a Canadian accent, The Calling subjugates itself as a serial killer vehicle mixing religious mumbo jumbo with the vanity arc of Jack Kevorkian. The proceedings begin by establishing a main character who is an alcoholic, pill-popping, suicidal policewoman (one of the all-time most used cop movie cliches in the book, the protagonist who is quote unquote "battling demons"). 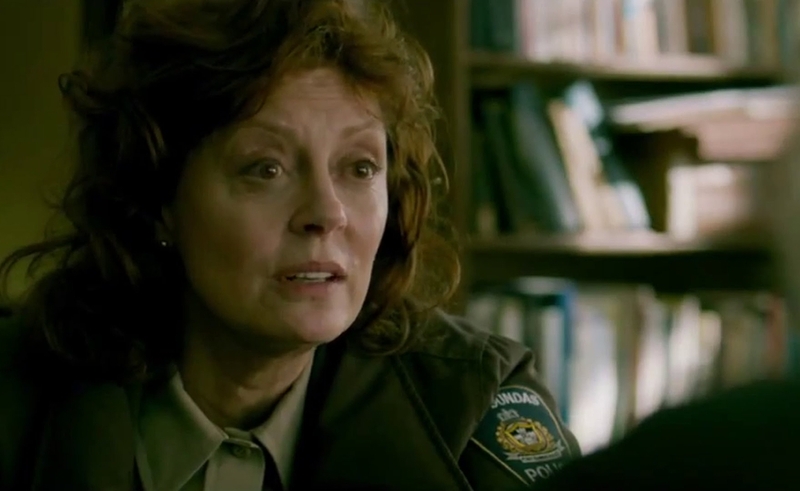 Susan Sarandon (as Hazel Micallef) plays said deputy. She lives with her mother, goes through a daily routine where virtually no crime ever occurs in her precinct, and shares her job with a rather pessimistic fellow detective (Ray Green played by Gil Bellows). She also works with a secretary (Katy Breier as Melanie Cartright) who basically exists to answer phones and break the tension by lightening the mood (another heavily used cop movie cliche, I looked it up). As things progress, a series of murders occurs in Fort Dundas (the first set of them in four years) prompting detective Micallef to sense that it's the same person who committed all of them. She eventually acquires a new partner in Ben Wingate (Topher Grace) and so begins an investigation about a killer who is believed to have an interesting set of motives. When this person dispatches their victims, their mouths are left wide open. And along with this sicko's overly creepy MO, the crime scenes involved, are at times uniquely gruesome (a women's neck is virtually cut clean through, a man's stomach is extracted from him and thrown to a bunch of dogs, another dead man lies in a trailer park bed with a serious case of rigor mortis setting in, oy vey!). 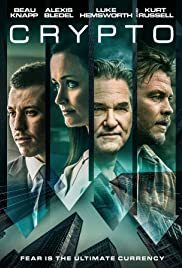 Essentially, this is a routine thriller that borrows heavily from stuff like 1995's Se7en (the whole crime scene aftermath thing occurs without Se7en's haunting film score) and Fargo (the wintry setting, the identical looking police uniforms, the exterior shots that if you squint hard enough, look as if you're actually watching the Coen brothers 1996 Oscar nominee). There are some effectively chilling moments and I like the fact that "Calling" is a slow burning exercise that really takes its time. However, the antagonist is revealed way too early (Simon played by Christopher Heyerdahl who looks like a cross between a bloodshot Woody Harrelson and Jeff Daniels) and when you find out that his victims actually want to die, well the creepiness and mystery (that existed early on) eventually become a non-factor. As for "Calling's" ending, I won't reveal what happens but I will tell that what's on screen is laughable. It's tacked on and provides a mild shock. But really, it just feels like the filmmakers ran out of fresh ideas. In conclusion, The Calling has decent acting and is passable for a weekend rental (or you could save five dollars by watching Criminal Minds reruns instead). At a running time of 108 minutes, I would "call" 40-45 of them worthy. Result: 2 and a half stars.